The BHO Mega Shake Jig combines the erratic action of a bladed jig with the noise and flash of the BHO 2.0 Blade Assembly into 1 wild, action packed bait! While the BHO Blade assembly does not always spin; it does always provide the noise, flash, and Lift that easily makes this bait a wake bait. For more consistent blade spin- slow the bait down. 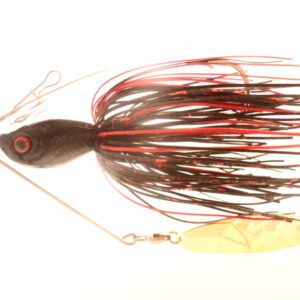 For wild erratic darting action- speed the bait up. To wake this bait- rod tip up on a medium retrieve. Don’t pass up the chance to try slow rolling this one!